I'm sure we've all been there, ladies; that time of the month strikes and you're down to your last pad/tampon/sanitary product of choice... Who else has had to dispatch unsuspecting boyfriends to the shop for Tampax!? Whilst it may be a good test of the relationship (bonus points if he also brings back chocolate! ), I think we can agree it's less than ideal. 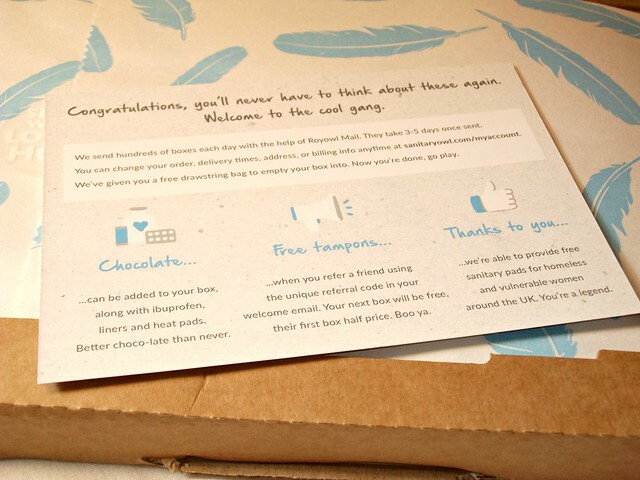 Enter Sanitary Owl*, a subscription service sending you pads, tampons and more through the post each month! Genius. 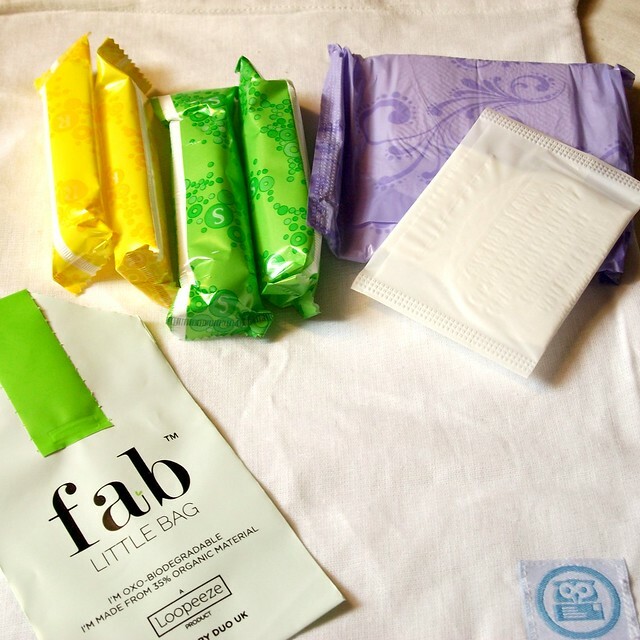 From Sanitary Owl's easy-to-navigate website, you can choose from a selection of tampons, pads and extras such as liners, chocolates, ibuprofen, tampon disposal bags and heat patches; there are a few brands to choose between, before you select the absorbency/ies you require for each product, and how many - you can mix and match to suit your flow, which is handy! You can choose up to 18 products in total for a standard subscription box, which is £3.99 per month including postage, and you can choose how often you want them delivered - so, if you have a particular heavy or long period and would need more than 18 pads and tampons, you could choose a weekly or fortnightly delivery, whereas if your cycle is long and your period short and light, you could choose to have a box every 12 weeks if that suits you better. It's a totally customisable service, which I love! I received a sample box for the purposes of this post, and I was really impressed with how beautifully it's presented - generally, I resent having to spend money on tampons and the like, but when it comes packaged this nicely, it's less of an annoyance. Your first subscription box also includes a handy drawstring canvas bag to store your sanitary products in, whilst the second box will come with a little zip pouch to carry your products on the go. I think the attention to detail is lovely! 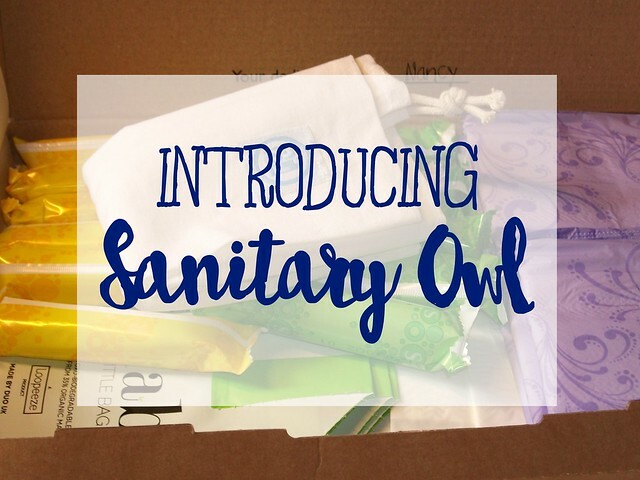 The folks at Sanitary Owl do some really important work as well, providing sanitary products to homeless women (can you imagine being homeless and having to deal with your period?! How horrible!) and supporting projects around menstrual health in developing countries - so you can support less fortunate people whilst having your sanitary products handily delivered through your door. There's your good deed for the day! If Sanitary Owl sounds like the kind of subscription service you could use in your life - no more late-night dashes to the all-night service station when you run out of tampons! - click here to start choosing your sanitary products and optional extras! Sanitary Owl also offer a few other products, including environmentally-friendly reusable products such as Mooncups and cloth pads, as well as a First Period box, which would be perfect for men or women with pre-teen or teenage daughters - a great way to have that chat about what your daughter can expect when she starts her period, and make sure she has everything she'll need. If you want to order, you can get your first box for just 99p with the code 'VIP99'! (Valid until 30/07/2016). Would you consider a subscription service for your sanitary products? Have you ever been caught short of a pad or tampon? Totally love this idea. My last period came a few days early and I was totally caught out, this would be a godsend. 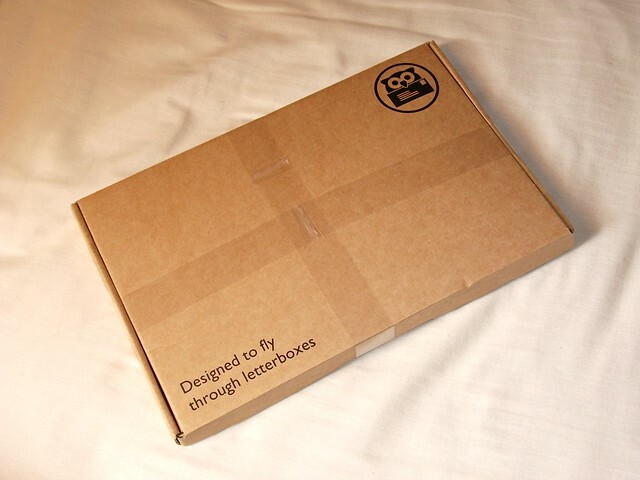 I am all for these kind of subscription services! I think this looks great. Ahhh I love the idea of this! My only issue is, is that I buy my sanitary products only when they're on special offer, so I buy them when they're like £2 for large box! I love that you can add in chocolate along with the tampons. I like that it is completely customable for you and your body ie heavy or light. I will certainly keep this idea in the back of my head for when my girls reach that age. I don't often get TOTM anymore due to my contraception, phew! What an absolutely ingenious idea! I could really use this as I often forget to get tampons after being pregnant/breastfeeding for most of the last 5 years haha! This is so cool!!! I never even knew anything like this existed - what a clever idea! It looks so cute and so simple and just saves having to remember. Also the idea of adding extras like chocolate etc is incredible! Such a good product and such a good post! What a really great idea. So handy to have them posted. Oh my goodness!!!! Who ever thought of this is genius. The amount of times I have forgot to go out and buy them.. or run out! Brilliant idea! Seeing as how I"m constantly running to the store at the last minute, I'm probably a candidate for something like this. It's convenient! I've been really fortunate that since I've gone on OCPs, my period went from being a horrendous nightmare, to barely existent. But for someone with a normal period, I think this subscription would be pretty awesome. That time of the month is kind of the worst, and it's nice to have a little something to make it more enjoyable! I think this is a great idea, especially for forgetful ones! I've started making a point of buying a couple of months worth of everything and then when I begin to get low, I top up. I always have quite a few bits and pieces in all of my bags just in case - mainly because I forget they are in there!